People in Garden County have decided that no one should go hungry. Three churches joined with Volunteers of America — Western Nebraska to start a food pantry about ten years ago and support has grown every year. This year three youth groups held fund raisers to support the food pantry. Churches, clubs and individuals donated food and money to keep the shelves full as an ever-increasing number of people come for help. Many people in the area live on very limited, fixed incomes or try to get by with minimum wage jobs. Volunteers are critical for the success of the food pantry — driving 70 miles to a food bank, collecting food from supermarkets and stocking shelves. Many of the people who use the food pantry volunteer their time unloading food and stocking shelves. The Food Pantry is located at Volunteers of America Western Nebraska in Lewellen, NE and is open Monday through Friday, 8:00 a.m.– 6:00 p.m. Anyone is eligible who feels they have a need for the food pantry. Volunteers bring food from the food bank to the Volunteers of America Western Nebraska food pantry. Donations of time, food and money make it possible to keep the food pantry full as the number of people who need the food pantry increases. Each year Volunteers of America Western Nebraska provides Christmas Baskets for families in need. Youth groups raise funds and collect food. 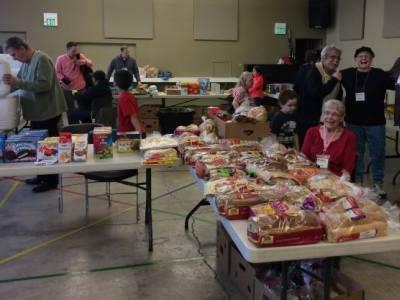 Church members and groups also donate cash and food. School children volunteer to put together Christmas boxes.